The projective, Moebius, Laguerre, and Minkowski planes over the real numbers are just a few examples of a host of fundamental classical topological geometries on surfaces. This book summarizes all known major results and open problems related to these classical point-line geometries and their close (nonclassical) relatives. Topics covered include: classical geometries; methods for constructing nonclassical geometries; classifications and characterizations of geometries. This work is related to many other fields including interpolation theory, convexity, the theory of pseudoline arrangements, topology, the theory of Lie groups, and many more. The authors detail these connections, some of which are well-known, but many much less so. 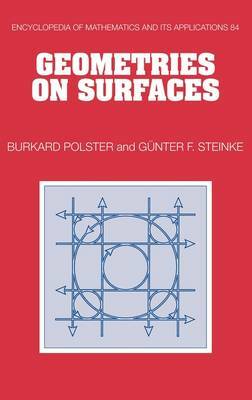 Acting both as a reference for experts and as an accessible introduction for graduate students, this book will interest anyone wishing to know more about point-line geometries and the way they interact.